A quick tip by Robert J. Kelsey from his wonderful book "Walking in the Wild - The Complete Guide to Hiking and Backpacking". This might be controversial to some, in fact many ultralight hikers argue to the nth degree about the finer points of Esbit and Hexamin vs alcohol to avoid just this, but this old tip is interesting and worth some further investigation. Whatever cooking ware you choose, prepare it properly for cooking. That means blacken the exterior! I will brook no argument on this point from spotless-pan paranoids. A pot blackened with good hardwood soot, which is shiny black and sticks to the pan, distributes heat more evenly and does a better cooking job. Posted on September 4, 2014 by Kevin Phillips and filed under Tips from the Archive and tagged Tips cooking pots blacken Walking in the Wild Robert J. Kelsey. 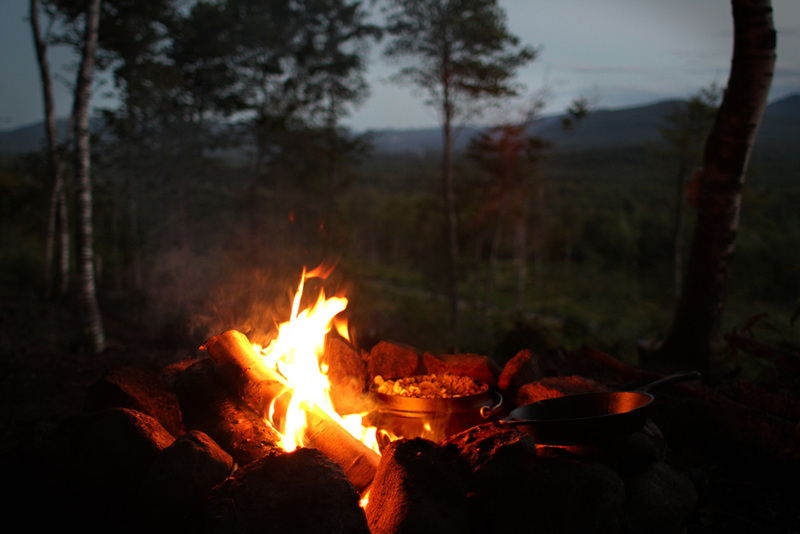 I'm often asked about campfire meals I make, I consider myself quite a freestylecook,as such I don't really write things down. I'm not qualified by any means, but I worked in kitchens throughout school and college and consider myself pretty confident in the kitchen. This is the first time I have ever consciously made notes and honed a recipe to share. Beef bourguignon is one of my favorite slow cooked meals, I think its pretty perfect for permanent camp or cabin cookery. Simple and delicious. Something you can throw on a fire and leave. This recipe is loosely based on Larousse Gastronomique's traditional dish. To start you will need some decent coals so make sure you build your fire big with suitable wood and let it burn down to cooking coals. This meal is slow cooked over a few hours so be sure to have a large stock of wood so coals can be replenished. Roughly cut the beef into large chunks and dust with seasoned flour and put you dutch oven on the coals to pre-heat. Cover and gently simmer for at least two hours; until the beef is meltingly tender and the sauce has thickened. Give it a try and adjust the seasoning to your taste. The dish came out very well. Tender meat with a thick delicious sauce. It was also incredibly easy. I hope, this inspires some of you to try something new on the campfire. Posted on September 13, 2012 by admin and filed under Recipe and tagged Beef Bourguignon campfire cookery cooking quisine recpie. Found in Harrison's "The First Book of Hiking" published in 1965, this concise yet poetic book is beautifully illustrated by E. Frank Habbas. Here is a list of items that should be included in the pack of any hiker who expects to be on the trail for several days. I particularly like the sound of plumbers candles. Posted on November 30, 2011 by admin and filed under Gear List and tagged 1960s books C- William Harris cooking E- Frank Habbas First book of hiking Gear List. My love affair with Trangia began at a very early age. My dad had owned one since before I was born, although he wasn't much of a hiker he is a "Swedophile" and a lover of robust, well made kit. My early years camping with him and my brother we're more about car camping, we had a two burner stove which was somehow rigged up to the same gas bottle my dad used for his blowtorch. This often led to an ignited hose coming loose and flailing violently around the tent for a few exciting seconds before we could kill the gas and begin firefighting operations. Highly entertaining at the time but on reflection actually quite dangerous. At this time the Trangia was used more for its pots and pans. But as we got older and our holidays became more adventurous, we ditched the giant four person tent, the gas cooker got left at home and the Trangia became the workhorse. The Trangia company has been around since the mid 1920's; founded in Sweden by John E. Jonsson and his father-in-law, they started out making household cookware and also developed a range of camping sets, kettles, mess tins, fry pans, mugs and plates. The Trangia name is a shortening of the village name Trångsviken, a small town in Sweden where Trangia is still based, it is combined with the initials "IA" - "I aluminium," translation "out of aluminium" or "in aluminium." In the late 1940's there we're few truly portable camping stoves. The ones that were available ran on solid fuel tablets in one form or another. There were spirit burning stoves on the market, but these we're intended for indoor use to supplement a wood fuelled stove. When visiting a sporting goods shop in Östersund Mr. Jonsson was asked if the meta-stoves (a brand of all-in-one solid fuel stoves) were any good. He replied "Yes sure, but it would be better off with a stove that was run with methylated spirits" This became the mission of the Trangia company and lead to the birth of their Storm Cooker. In 1951 the first Trangia stove, the model 25, was finished, and looked almost identical to the current Trangia. The company had taken what had gone before and refined it. This constant evolution continues to this day encompassing cutting edge materials and the accommodation of new burner types. Over the last 50 years hundreds of people have bought and loved Trangia stoves. This beloved piece of kit has written itself into the history books of hiking and will continue to do so. As well as this its burner construction has been used as a template for numerous ultralight stoves. The simple, reliable, safe, indestructible construction and constantly evolving design of the Storm Cooker has ensured that it will firmly stand the test of time. I finally bought my own Trangia in 2005 after many years of borrowing others'- a smaller model 27, and it has been a companion on every multi-day hike I have done since. Even though there are newer, lighter, more efficient stoves none will hold such a place in my heart or my backpack. Much of this information and imagery was sourced from the Classic Camp Stoves forum with the help of Spiritburner and his many contributors. He put a lot of legwork in and was able to get in touch with Malin Svensson from Trangia who provided much of the historic details. Trangia timeline courtesy of Malin Svensson. Early 1960's - the holder for the burner moves from upper to lower windshield. 2010 - Trangia is already a registered Trademark but now the Trangia Stove is also a registered 3D shape which protects the stove from unlawful copying. Posted on November 13, 2011 by admin and filed under Classic Kit and tagged cooking Gear Storm Cooker Sweden Trangia.